You will find most of the shopping in Banff in the downtown area, the hotel shops, and the gift shops associated with various attractions. 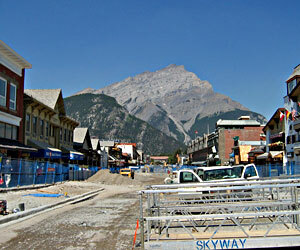 In 2007 the downtown shopping area took a major hit due to extensive renovation of downtown Banff. Two blocks of Banff Avenue, between Wolf Street and Buffalo Street, were closed as the street was widened and old sewer and other utilities replaced. Shoppers were pressed into narrow walkways in front of the shops and parking was hard to find. As usual, the people of Banff went out of their way to make the best of a difficult situation. For us, the downtown shopping in Banff experience, including eating in the many restaurants along torn-up Banff Avenue, was as enjoyable as in past years. But things got better in 2008, as described by Canadian travel writer Gord Collins below, his article discusses the details of the renovation and much more of interest to a visitor shopping in Banff or participating in other activities. Every world class tourist destination needs a facelift once in a while and Banff Alberta Canada had its rebirth in 2007/2008. Banff Avenue, Banff's main street underwent significant development making 2007 a painful year for tourists and shop owners alike. Century old utility infrastructure had to be replaced and the modernization was finalized in December. The renovated area only affected two blocks of the downtown area, where most of the town's shops are located. The completion of the huge engineering project was delayed in May because of unseasonably cold and rainy weather which prevented compacting gravel, pouring and curing asphalt. The bad weather could have created another disaster but Standard General Construction managed to get the job completed on time and traffic is now flowing on Banff Avenue. Banff Avenue is Banff's main arterial route dividing the town in the center. The downtown area is primarily a 5 block area bounded by Elk Street, Squirrel Street, Caribou Street and Beaver Street. North of this area is the Banff hotel district where you'll find the major chain hotels and chalets. There are a couple of Banff hotels in the downtown core. Downtown Banff is a fascinating place where local residents and tourists intermingle and where you'll see mountain climbers, skiers, extreme sports enthusiasts, and campers converge to find the products and services they need. The only other town they can find such conveniences is in Canmore, which is 30 miles south along the TransCanada highway. Mountain towns such as Banff and Canmore, and Lake Louise are special places. Mountain culture is different. People here behave differently as though every moment was special and every acquaintance meaningful. The cool crisp air and the bustle of people shopping at boutiques and book stores make it an interesting place to stroll around. For those who must have a modern shopping mall, there is a four story Sundance Mall housing retail giftware, cafes, confectionaries, clothing, jewellery, skiing and snowboarding equipment outlets and restaurants. There is a Laundromat in the basement and it is a busy place given that hotels, chalets and camp grounds may not have laundry facilities. Doing the laundry is just part of the Banff experience. There are a few Japanese and Korean restaurants here but most people prefer the North American Style faire served at the popular restaurants. The best of those would be the Grizzly House Restaurant, Wild Bill's Legendary Saloon & Cookhouse (no children), Earls Banff Restaurant, The Elk & Oarsman Pub, The Bison ~ Mountain Bistro & General Store, The Mount Royal Hotel, Evergreen Restaurant in Delta Banff Royal Canadian Lodge, and Phil's Restaurant for their breakfast menu. Try a Bison or Elk Burger at the Bison with its relaxing atmosphere, vaulted ceiling and great views of Tunnel Mountain and Sulphur Mountain. The scenery is a big part of a restaurant visit here. Plenty of accommodations are available in Banff but you can't take for granted that they'll be available so book ahead of time. From experience I can tell you the best accommodations in Banff are also the most expensive. The Famous Banff Springs Hotel is a gem but expect to pay $500 a night but you get to immerse yourself in Banff's history and an amazing hot springs and pools. The views are amazing and it is more like a Castle than a hotel. Banff Canadian Royal Lodge is nice too. It is quiet with clean rooms and air conditioners, a convenience you won't find in most Banff hotels. If it's a hot summer day in the Rockies, expect to experience a little sleeping discomfort in some of the hotels. Most of the other hotels have slightly better prices but remember that demand for hotel rooms here is high and there is a limited quantity. The International Hotel and Ptarmigan are close to downtown. The Ptarmigan has some excellent loft suites at the back. Get one on the upper floor. The rest on Banff Avenue are more or less average hotel rooms but the location is great. You'll be able to walk to downtown Banff. That is part of the experience of being in Banff. The most frequently visited bars are Wild Bill's Saloon, The Aurora, and the Hoodoo Lounge. Keep in mind this is Banff, not 11th Avenue in Calgary or Queen Street in Toronto. All the hotels cater to bus loads of tourists arriving daily from Japan and Britain. The local tour companies have their offices in downtown Banff. Discover Banff Tours is a large adventure tour company offering all kinds of activities such as hiking, raft rides, and trips to local attractions such as Johnson Canyon and Lake Louise. There are plenty of reasons to rejoice at the completion of construction on Banff Avenue. One is to shop for Rocky Mountain art, or sit and drink coffee at one of the Evelyn's Coffee shops. It's nice to know Banff is back in full gear and ready to give us city dwellers a rich taste of mountain life. Canadian Travel Writer Gord Collins is a frequent visitor to Banff National Park and an avid Rocky Mountain adventurer enjoying the best Banff Hotels, Banff Restaurants and other mountain activities of Banff and Canmore in Banff National Park.